It looks like NBC is returning to the Lone Star State. 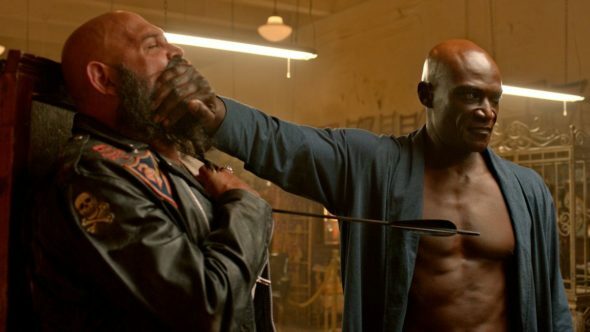 According to The Hollywood Reporter, the network has renewed Midnight, Texas for a second season. Based on the books by Charlaine Harris, the supernatural drama centers on the inhabitants (human and otherwise) of a small, mysterious Texas town. The cast includes François Arnaud, Dylan Bruce, Parisa Fitz-Henley, Arielle Kebbel, Jason Lewis, Peter Mensah, Sarah Ramos, Yul Vázquez, Bob Jesser, and Joanne Camp. Midnight, Texas debuted this past July to underwhelming ratings for NBC. Over the course of 10 episodes, season one averaged a .74 rating in the 18-49 demo 2.994 million viewers. And while the numbers are low, Midnight, Texas still managed to be the top-rated summer drama last year. Producers Eric Charmelo and Nicole Snyder will take over as showrunners for season two. UNIVERSAL CITY, Calif. – Feb. 14, 2018 – “Midnight, Texas,” the #1 summer broadcast drama in the 18-49 demo, has been renewed for a second season on NBC. The supernatural thriller, which is based on the best-selling book series by Charlaine Harris (author of the novels that inspired “True Blood”), takes a journey into a remote Texas town where nothing is what it seems. In Midnight, Texas, being normal is strange and only outsiders fit in. It’s a mysterious safe haven for those who are different – a perfect place for anyone looking to hide from the outside world. What do you think? Have you seen Midnight, Texas? Will you watch season two? looking forward to season 2 !!!!!!!!!!!!!!!!!!!!!!!!!!!!!! I loved the first season and am anxiously awaiting the second season! Best show on TV! I would definitely watch Midnight Texas season 2, I loved the first season! I watched this show from the beginning, fascinated to see what Season 2 brings! Can’t wait!